LEFT: C. H. Sternberg photograph of Protostega gigas (CMNH 1420/1421 reconstruction). Wherein Charles Sternberg describes the discovery and preparation of a specimen of Protostega gigas (CMNH 1420 and 1421) that is now on exhibit in the Carnegie Museum of Natural History in Pittsburgh, PA. I was interested to note Sternberg's comment that it was found in Gove County... (NOT!). Wieland (1906, p. 282) wrote that CMNH 1421 was collected from along Hackberry Creek in southern Gove County, Kansas and that the two specimens were found fairly close together. If this locality had been correct, these specimens would be the earliest known examples of the species. However, Sternberg (1909, p. 116) wrote in his book, The Life of a Fossil Hunter, that he "should like to correct this mistake. It was found about three miles northwest of Monument Rocks, in a ravine that opens into the Smoky [Hill River], east of where Elkader once stood." See more about Charles H. Sternberg here. I met with one experience in the Chalk of western Kansas, last August, that I shall not soon forget. I had some pleasure in looking for the first time upon a perfect skeleton of a very rare animal, that once lived in the Cretaceous ocean. My great sorrow was that I could not save it in the condition in which I found it, to grace the museum of one of our large universities, where it would have been cared for and highly prized. - It was, I believe, the only perfect skeleton ever seen by anyone, except myself, and those few persons who chanced to pass, when I had, after several days, succeeded in brushing off the loose chalk and impure gypsum in which it was entombed. I bad no camera and am not an artist, or I could have given great pleasure to many authorities in paleontology by picturing it as it lay exposed to the but sun, which had not looked down upon it for millions of years, since, full of life and motion, it was the boatman of the Cretaceous ocean, now known to science as Copes Protostega gigas, the first great roof,The largest of all sea turtles. This was a perfect skeleton, lying in a low wash in Gove County, Kan., only a few inches below the surface in material that had become disintegrated, and in which the peculiar shrub that lives in the chalk and shale beds, had been living in luxury, covering the bones with a compact mess of rootlets, eating up the hard outer surface, and would eventually have entirely consumed it, had I not happened along to tear them away. To add to my sorrows, the bones themselves bad been broken to pieces by the uplift of the strata, and were covered with a thin layer of blue clay, that also filled the cracks; this acted like mortar. It could not be brushed off without bringing up fragments, and it prevented me from covering the bones in sections with starched paper, or cloth, to strengthen and hold the fragments in place, so they could be taken up, restored and mended in the laboratory, as the damp starch would have loosened the clay and left the bones behind. For hours, I thought of every conceivable plan I could adopt to save the skeleton entire, as I had uncovered it, but had to give it up, and took up several hundred pounds of fragments, that will require the patience of Job and great skill to restore the skeleton more or less complete. The animal lay down to die in its natural position. The carapace was slightly shoved by pressure a little out of line by rough measurement it was 8 feet from end of snout to the end of tail, and 6 feet between the marginal bones in their widest part. 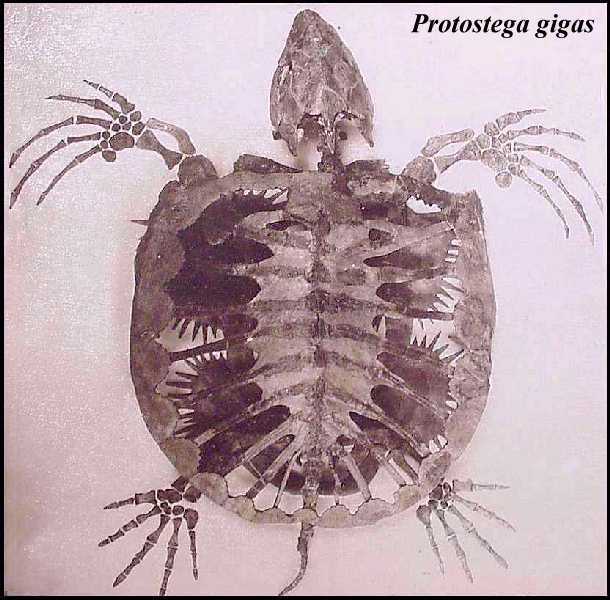 Bearing in mind that I am not an anatomist but a collector, and have had no time to study the structure in detail of the thousands of fossil animals I have collected, I will give as perfect a description as possible for me, of this famous turtle. 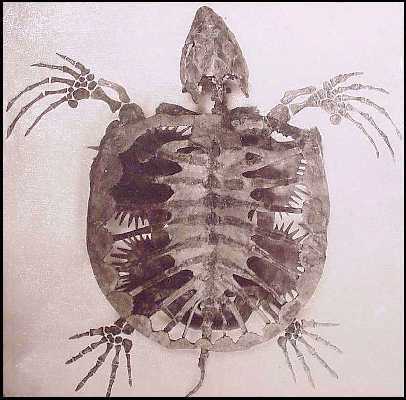 The carapace seemed to consist of wedge-shaped elements, along the central axis, which were joined by sutures at either end and from which radiated (except in the center, where they were at right angles), 8 pairs of rib-like bodies, broad and compressed, and united by sutures for several inches and then rapidly narrowed to a rib two inches wide, which projected free to the marginal plates. The central rib, from the middle, both ways of the carapace, was nearly three feet long. The marginal bones were small with thick outer lips, and by their beautiful sutures appeared to be joined to the great plates of the plastron, of which there were four large ones, an inch thick in the center, beveled off to a thin edge with long finger-like projections to fit in their fellows and the marginal bones. Joined to these four great plates were two in front and two behind, with outer edges thick end curved, to allow the passage of The four powerful limbs, or paddles, and the neck and head in front and tail behind. The paddles ended in long claw bones, or ungual phalanges. The skull was large. This, in brief, is what I saw that hot August day: and I have now in my workshop the fragments I was able to save, dreading to go to work on it, as, though many good bones can be restored, I know the careful tedious work necessary even to do that; and I never (nor can any one) mount it for one of our universities as I saw it in its burial place in western Kansas. The above was written a year ago. In last June number, under the title The First Great Roof, appears a later article, showing the remarkable progress I am making in the restoration of this must wonderful of all sea-tortoises. I now believe the skeleton can he nearly restored. Cope, E. D. 1872. A description of the genus Protostega, a form of extinct Testudinata. Proceedings of the American Philosophical Society 12(88):422-433. Derstler, K., A. D. Leitch, P. L. Larson, C. Finsley and L. Hill. 1993. The world's largest turtles - The Vienna Archelon (4.6 m) and the Dallas Protostega (4.2 m), upper Cretaceous of South Dakota and Texas. Journal of Vertebrate Paleont. 13(suppl. to no. 3):33A. Hay, O. P. 1895. On certain portions of the skeleton of Protostega gigas. Publ. Field Columbian Museum, Zoological Series (later Fieldiana: Zoology), 1(2):57-62, pls. 4 & 5. Sternberg, C. H. 1899. The first great roof. Popular Science News 33:126-127, 1 fig. Sternberg, Charles H. 1900. Fossil-collector's experiences. Popular Science News 34:34. Sternberg, C. H. 1905. Protostega gigas and other Cretaceous reptiles and fishes from the Kansas chalk. Kansas Academy Science, Transactions 19:123-128. Sternberg, C. H. 1909. The life of a fossil hunter. Henry Holt and Company, 286 p. (reprinted by the Indiana University Press, 1990). Wieland, G. R. 1906. The osteology of Protostega. Memoirs of the Carnegie Museum, 2(7):279-305. Wieland, G. R. 1909. Revision of the Protostegidae. American Journal of Science, Series 4. 27(158):101-130, pls. ii-iv, 12 text-figs.